A documentary about the life of renowned German art forger Wolfgang Beltracchi will be screened at 7 p.m. Friday, Aug. 3, in The Cole Art Center @ The Old Opera House in downtown Nacogdoches. NACOGDOCHES, Texas - The Stephen F. Austin State University School of Art and the Friends of the Visual Arts will present a free, one-night screening of "Beltracchi: The Art of Forgery" at 7 p.m. Friday, Aug. 3, in The Cole Art Center @ The Old Opera House in downtown Nacogdoches. 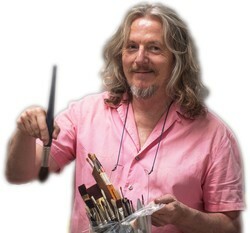 The documentary is described at imdb.com as "a mesmerizing, thought-provoking yet surprisingly amusing documentary on the life and times of Wolfgang Beltracchi, who tricked the international art world for nearly 40 years by forging and selling paintings of early 20th-century masters." "Beltracchi: The Art of Forgery" earned Best Documentary at the 2014 German Film Awards and winner in Documentary in Fine Art and Photography at the 2016 Master of Art Film Festival. The film is directed by Arne Birkenstock. The screening is part of the School of Art's monthly Friday Film Series and is sponsored in part by William Arscott, Nacogdoches Film Festival, Karon Gillespie, Mike Mollot, David Kulhavy, Brad Maule, John and Kristen Heath, Galleria Z, Jill Carrington, Jean Stephens, Jim and Mary Neal, Richard Orton, Nacogdoches Junior Forum and Main Street Nacogdoches.